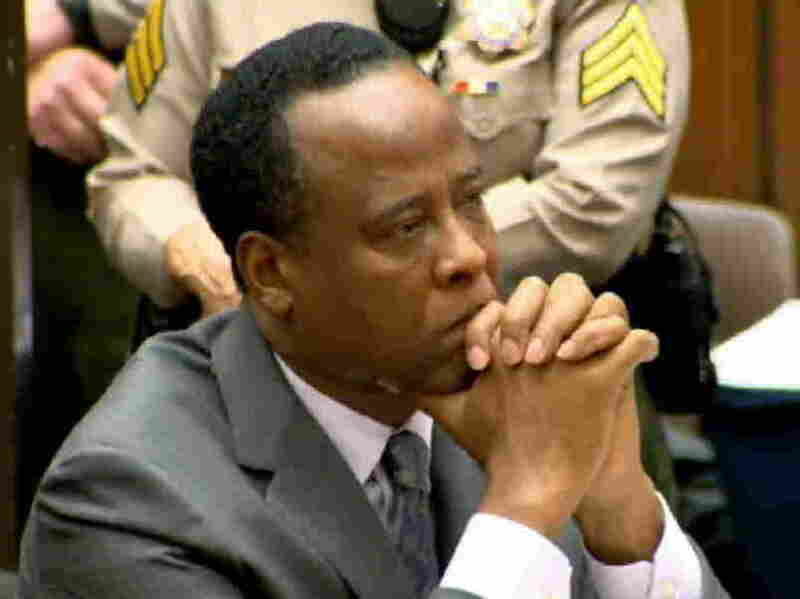 Michael Jackson's Doctor Gets Four Years : The Two-Way Dr. Conrad Murray gave Jackson the powerful anesthetic propofol. The pop star used it to help him sleep and prosecutors showed that Murray's gross negligence contributed to Jackson's June 2009 death. In this CNN screen grab, Dr. Conrad Murray listens as he sits in court during his sentencing for the involuntary manslaughter of singer Michael Jackson. The doctor found guilty of involuntary manslaughter in the 2009 death of pop star Michael Jackson was just sentenced to four years in prison. In imposing the sentence, Superior Court Judge Michael Pastor said Jackson died "because of the actions of and the failures to perform legal duties" on the part of Dr. Conrad Murray. The physician, Pastor said, betrayed his patient and his profession. And Murray, the judge added, tried to "blame the victim" — Jackson — and has shown no remorse. "The doctor insisted he used small amounts of propofol to help end an increasingly desperate Jackson's insomnia — a use the drug isn't approved for. But that was countered with evidence that he'd ordered vats of the stuff delivered to the apartment he shared with his girlfriend — and a parade of doctors, including a key witness for the defense, who all said they would never use propofol at home." This Associated Press video highlights some of the judge's comments during the sentencing. Update at 1 p.m. ET: The prosecution had asked for the judge to order Murray to pay more than $101 million in restitution — much of it based on the potential earning power of the concert tour the singer was rehearsing for in 2009. Pastor said he needs more time and information before setting any amount. According to The Associated Press, "it's unlikely that Murray can pay any sizable sum."